Entertainment: There is live entertainment and complimentary wine and beverages served every Friday afternoon. There is also music appreciation every Thursday afternoon and matinees on Sundays. Social Events: Our well planned social events are always well attended. There is plenty of laughter and enjoyment had by all. Spiritual: We hold church services at our residence and there are several spiritual leaders who come in to perform individual mass, prayers etc. Physical Activity: We have exercise classes twice per week that are geared specifically to the needs of seniors. The seniors are involved in stretching, light weight therapy, endurance and balancing. 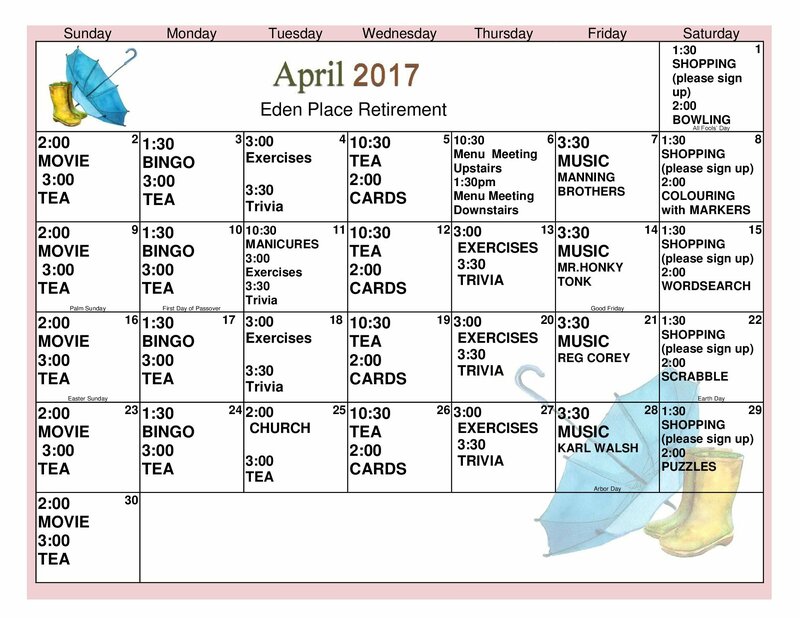 We also play darts, horse shoes, bowling and so much more at Eden Place. In the warmer weather there is the option to help out in the gardens or just enjoy our beautiful private patio. Mental Stimulation: We have cranium crunches, trivia and much more to help keep ourselves keen. We also host ongoing card games.